If you request an individual, he or she may be a politician or civilian to wish for our country, you’ll hear pretty much common wishes like India should be a country where people live for universal rights, explained by endearment, compassion, understanding and India should a country without dogma, insecurities, caste, creed, gender and religion. However, very few acts on those terms to make our country better. 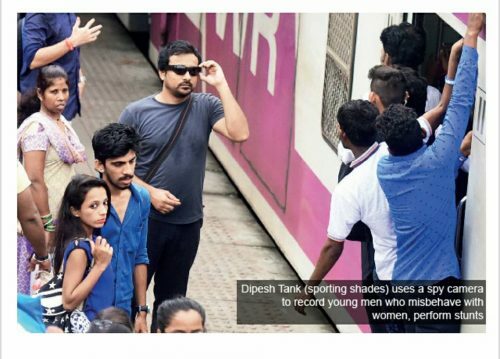 Yes, Dipesh Tank is one of them and he did a fabulous job by innovating a sunglass that has an in-built HD spy camera, records men misbehaving with women across Mumbai’s train network. Can you imagine the intensity of this action? How important it is for our society to track all these malfunctions in public places. How do you feel if anyone misbehaves with your mother, sister or wife when they are returning from work, travelling in local trains or buses. After exhausting daily life can they afford this kind of misbehaving? Off course not. Dipesh couldn’t tolerate this incident and he invented his glass to clean the society. Dipesh Tank and his nine friends started a campaign, called ‘War against Railway Rowdies’ in 2013 and they helped the railway police to arrest around 150 sexual harassers in Mumbai locals. I am not a superhero. I am a human too. I get tired at times….I want people to stop applauding and start doing it themselves. I dream of a day when I can let go a fight against eve-teasing because there will be enough people to fight against it. Currently, Dipesh is working with an NGO “Take her back”-which works against human trafficking in India. Guys, this is the time to act against all these abnormal people in our society. Only wishes don’t work anymore to build a nation. Show your ability, be the movement, be a DOER! !